Below are Western style horse headstalls for sale. A headstall is a hanger put on a horse's head used for holding a bit, bosal, nose piece, or other piece of equipment to guide a horse while riding. When a headstall is combined with a bit (or nose piece, etc.) the combination is known as a bridle. For more information about headstalls please scroll down beneath the items for sale. You might also like to see bridle and breast collar sets. 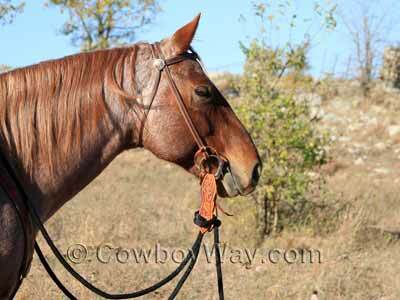 Below: A roan horse wears a browband headstall with a snaffle bit, slobber straps, and a nylon mecate. If you'd like to narrow your search you can use the links below to see specific types of headstalls. All of the links below will open directly on the Amazon website. A headstall is a hanger put on a horse's head used for holding a bit, bosal, nose piece, or other piece of equipment to control a horse while riding. When a headstall is combined with a bit (or bosal, nose piece, etc.) the combination is known as a bridle. Crown piece. The crown piece goes over the top of the horse's head, behind its ears. As the crown piece extends down the side of the horse's head it meets up with the cheek pieces. The browband. Not all headstalls have a browband, but they are very common. The browband goes in front of the horse's ears, across the brow. 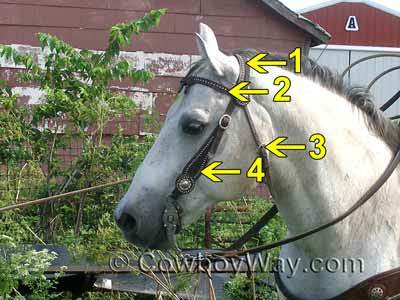 Its purpose is to keep the headstall from sliding down the horse's neck while riding. Throatlatch. Not all headstalls have a throatlatch, but they are also very common. The throatlatch goes underneath the horse's head behind the throat. Cheek pieces. The cheek pieces buckle onto the crown piece then continue on down each side of the horse's head, or cheeks. Cheek pieces have fasteners of some type at the bottom in order to attach a bit, bosal, or nose piece. The type of fasteners can vary widely. If you find a headstall you like but you're not ready to purchase it right away, you can always add it to your shopping cart so it will be easy to find later. In most cases, Amazon.com will keep track of your headstall, and anything else in your shopping cart, for 90 days. Later on, if you decide you don't want the headstall after all, it's easy to click "delete" and remove it from your cart. In the meantime, if you want to check out with other items, click "Save for later" to move the headstall to a separate, but still easy-to-find list beneath your shopping cart.